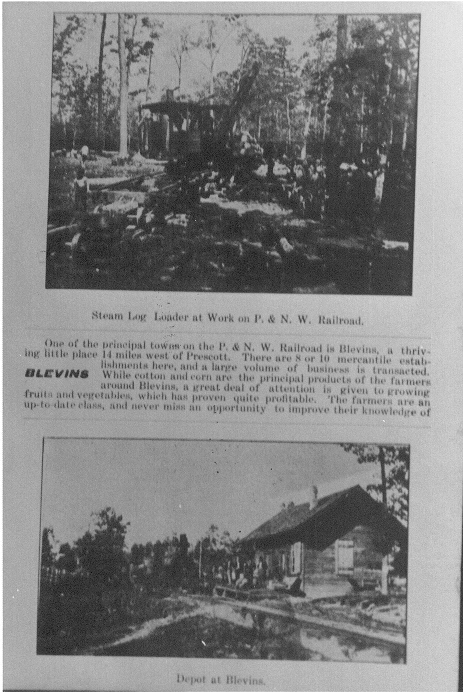 P&NW logging and Blevins Depot around 1900. Top photo - Steam log loader at work on P&NW Rail Road. Bottom Photo - Depot at Blevins. One of the principal towns on the P&NW Rail Road is Blevins, a thriving little town 14 miles west of Prescott. There are 8 or 10 mercantile est. here, and a large volume of business is transacted. While cotton and corn are the principal products of the farmers around Blevins, a great deal of attention is given to growing fruits and vegetables, which has proven quite profitable. The farmers are an up-to-date class, and never miss an opportunity to improve their knowledge.